Limit 3 per person. Valid only at listed location. No substitutions. Tax not included. Photographs allow you to capture a moment in time, without having to bribe a grandfather clock or upgrade to reality TiVo. Outfit your images with today’s Groupon to Opus Art and Design Media, located on West Hastings Street. 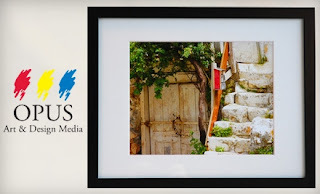 Bring your own digital photograph to the skilled staff at Opus Art and Design Media, and they’ll create a stunning 8”X10″ print on Canson Infinity Baryta Photographique paper. Next, choose a mat (in warm white, bright white, or black) and a stylish, modern frame to get your print apartment-ready. Quality pigmented inks, unlike dead-beat friends, bring the true potential out of pictures, ensuring they spend a successful life pinned securely against an inviting, nurturing wall.